Whether you recognize the name or not, you know J. K. Simmons. A that guy among that guys, Simmons has appeared in scores of films and dozens of TV shows – sometimes simultaneously – and he’s never turned in a mediocre performance. Perhaps the most reliable character actor of all time, Simmons finally gets a role that will no doubt draw Oscar attention with Whiplash. He plays Terence Fletcher, the meanest, most abusive professor at the finest music conservatory in New York. Miles Teller plays the driven young drummer taking the lion’s share of his torment at the moment. Writer/director Damien Chazelle has crafted a unique and immensely tense human drama, and his casting could not have been better. Teller and Simmons offer not an inauthentic moment as both inhabit characters that are not like the rest of us, which is necessary in an environment where the next Charlie Parker could emerge. There is something excruciating and beautiful and dizzying about their bursting volcano of a relationship. That neither is an entirely good person makes the film that much fresher. 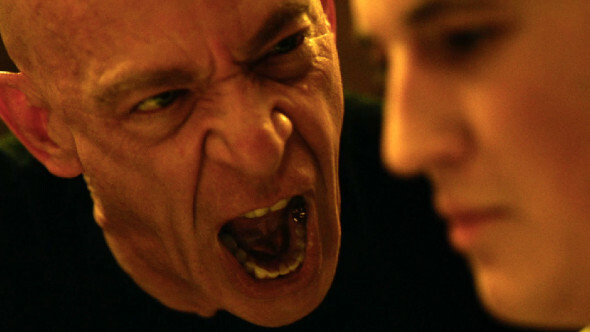 Surprisingly, Whiplash is neither victim versus victimizer nor is it a testament to tough love. Chazelle abandons all cliché, rarely taking the predictable course. His provocative choices and his leads’ fearless work set this film far apart from other mentor/mentee pics. Teller has real talent, a fact made clear in his screen debut Rabbit Hole. He understands the drive, arrogance, need and insecurity roiling beneath the surface of his character. His screen time with Simmons is violent, vibrant magic. Whiplash takes us to the burgeoning of that solitary, lonesome madness that marks so many artistic geniuses. It isn’t tidy, it isn’t comfortable, it isn’t quiet but it is endlessly fascinating and it sounds good.